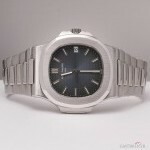 Case material: Steel; Charge: Automatic; Conditions: Never worn Presentation condition : With boxes and all papers; Place: Usa, Boca Raton Model: Nautilus Price on request Jewels in Time Reference: 3700/1 Near mint preowned vintage mens Patek Philippe 1st generation Nautilus automatic dates to 1978. 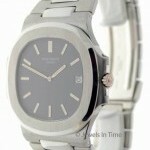 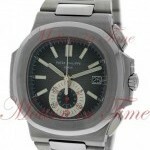 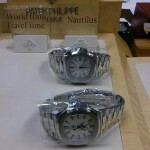 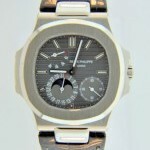 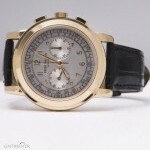 Comes with its Patek carton and Patek Archival document. 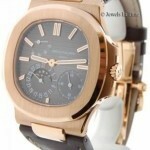 The holy grail of Patek collecting. 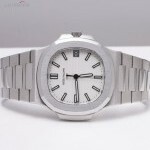 Case material: Steel; Charge: Automatic; Conditions: Never worn Year : 2014; Presentation condition : With boxes and all papers; Place: Usa, New York Model: Nautilus $ 42320 Giulio Bonaccio OROLOGIOINC NYC Reference: 59801A FS Patek Philippe PP 5980 white dial CHRONO SS complete boxes and all papers and tags unworn conditions AS TRADE I DO TRADE WITH OTHER PAMS IF U HAVE A SPECIAL EDITION PAM ONLY PLEASE OTHERWISE STRAIGHT SALE ONLY Please email me for more scans Tons of References Worldwide for your piece of mind and worry free Transaction i accept as payment Bank wire ALSO local pk up in NYC MANHATTAN ALL THE WATCHES POSTED ARE AVAILABLE TO VIEW OR TRY ON AT OROLOGIO INC. 420 MADISON AVENUE NY NY 10017 Tel.212 354 8402 MONDAT TO FRIDAY 9 AM TIL 5 PM PLEASE CALL FOR APPOINTMENT,THANKS With All My Best Regards Giulio GBONACCIO@GMAIL.COM Orologio Inc is not an authorized dealer for any of the watch brands it sells, non affiliated with any of these companies. 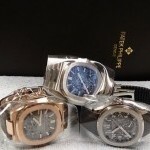 All brands are registered trademarks of their respective owners i`m a collector and i buy ,trade and sell only pre owned watches ALL THE WATCHES THAT I SELL INCLUDING 2 YEAR S WARRANTY WITH MY STORE. 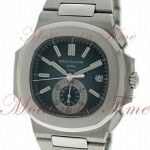 Case material: Steel; Charge: Automatic; Conditions: Never worn Presentation condition : With dealer guarantee ; Place: Usa, Boca Raton Model: Nautilus Price on request Jewels in Time Reference: 5980/1A-001 Brand: Patek Philippe Model: Nautilus Reference: 5980/1A-001 Case: Stainless steel with transparent back Size: 40.5mm Dial: Blue grey striated dial Attachment: Patek stainless steel link bracelet with locking deployant buckle(fits up to a 7.5 inch wrist) Movement: Automatic Box/Papers: Box and papers. 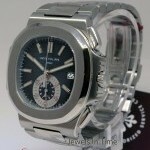 Comes with our JIT 2 year warranty. Notes: Mint (and just back from Patek full service)preowned mens Patek Philippe Nautilus chronograph comes complete with its boxes and papers and stylus. 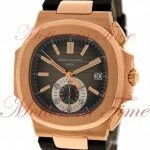 Retail: $51,000.